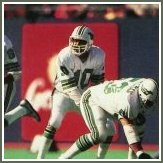 Check out the searchable USFL stats from the Stats Crew. Order the book, The United States Football League, 1982–1986. A team that was once compared to a bunch of trained gerbils by its owner has to count as one of the most interesting teams in the history of professional football if nothing else. Such was the case of the Washington Federals, a team which won just one of it's first 14 games. Each week it seemed as if the Feds had figured out a new way to blow a football game. 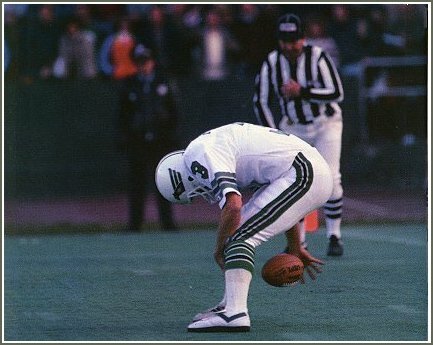 The Federals lost on last-second field goals of 50 and 52 yards, a 98-yard TD pass, a missed chip-shot field goal, and a quarterback sneak that came up one foot short. And that was in their first season alone. Washington was reborn in silver helmets and redesigned jerseys for the 1984 season, but proved they were the same old Feds with a 53-14 loss to the expansion Jacksonville Bulls in week one. Head coach Ray Jauch was canned shortly after that one. The Federals went 0-8, winning only one of their first 11 games, and what was left of the RFK crowds withered away. In every cloud, and the Federals were a pretty big one, there exists a silver lining. Washington did have some talent on the roster. Runningback Curtis Bledsoe rushed for 1,080 yards in 1984, and wide receiver Joey Walters caught 98 passes for 1,410 yards the same year. Craig James topped the team with 823 yards on the ground in 1983 despite missing several games with injuries. Runningback Billy Taylor added 757 rushing yards and 523 yards on 64 pass receptions. But the story of the Federals is not one of success. Washington QBs tossed 65 interceptions compared with 45 touchdowns. Following the disastrous 1984 campaign, the Federals were supposed to be bought by Sherwood Weiser and moved to Miami, but when the league's move to the fall was announced, Weiser pulled out having no desire to compete with the Dolphins. Don Dizney then bought the team and moved them to Orlando where they became the Renegades. Their Finest Hour: Not much to choose from here. But the Federals first win came over the eventual champion Michigan Panthers, and it was an exciting one. Washington jumped out to a 16-7 advantage at halftime but saw the last of it's lead slip away on a 43-yard field goal by Novo Bojovic that tied it at 16-16 on the last play of regulation. Not willing to let their first victory escape that easily, the Feds took the overtime kickoff and needed just six plays to drive 72 yards, culminating with a 22-yard Kim McQuilken to Joey Walters TD pass for the 22-16 win. Alternate (suggested by David Kendrick): "It was in 1984, when they spanked the Generals 31-17 at RFK. The Feds ran the opening kickoff back for a touchdown and put together their longest scoring drive ever (98 yards). The game was played on a Friday night, and there were fireworks at halftime. Mike Hohensee played a career game. It was one of the few Feds' games where it wasn't raining or 100 degrees."